Trilobites are members of the phylum Arthropoda (jointed-foot animals). Arthropods have segmented bodies and appendages covered by an exoskeleton which provides support and protection for muscles and organs. Living Arthropods include insects, spiders, scorpions, ticks, crabs, lobsters, barnacles, and centipedes. Trilobites belong to an extinct class of marine organisms called Trilobita. This name refers to the three-part (tri-lobes) latitudinal and longitudinal shape of a trilobite’s exoskeleton. The latitudinal lobes consist of the cephalon (head), segmented thorax (body), and pygidium (tail); the longitudinal lobes consist of two lateral lobes (on each side of the body) and an axial lobe (central back area of the exoskeleton). More than 500 different trilobite species have been found across Utah, in a broken band of Cambrian Period (570 to 500 million years old) limestones, siltstones, and shales that trends northeast-southwest across the western part of the state. During the Early Cambrian (about 570 to 540 million years ago), western Utah was covered by a shallow sea. Slow-moving rivers flowed across the sandy lowlands of eastern Utah deposited sediment into the sea. The heavier sediment (mostly sand) was deposited near the shoreline which metamorphosed through time into quartzite. The lighter sediments (mostly silt) were deposited farther out into the sea, and through time lithified into siltstone and shale. The deepest part of the sea was an ideal environment for the precipitation of calcium carbonate, which lithified to limestone. Regional subsidence during the Middle and Late Cambrian (about 540 to 500 million years ago), caused the sea’s shoreline to migrate eastward across Utah, allowing the deposition of a fairly complete sequence of Cambrian sediment in western Utah. Utah was located near the equator during the Cambrian, so the water temperature was warm. The combination of warm, shallow water and nutrient-rich silt allowed several marine genera to thrive. The most common and diverse of these were trilobites, which occupied several different marine environments. Where did they live in the sea? Most trilobite species were bottom dwellers that crawled over sand and mud. Some of them could curl up like modern pill bugs. Other trilobites burrowed into bottom sand and mud using their shovel-shaped cephalons. These crawling and burrowing trilobites were either scavengers, or they ingested mud and silt, digesting the organic material contained in it like modern day worms (annelids). Some trilobites lived in shallow burrows where they could keep their heads near the surface of the sand or mud, and grab passing prey. 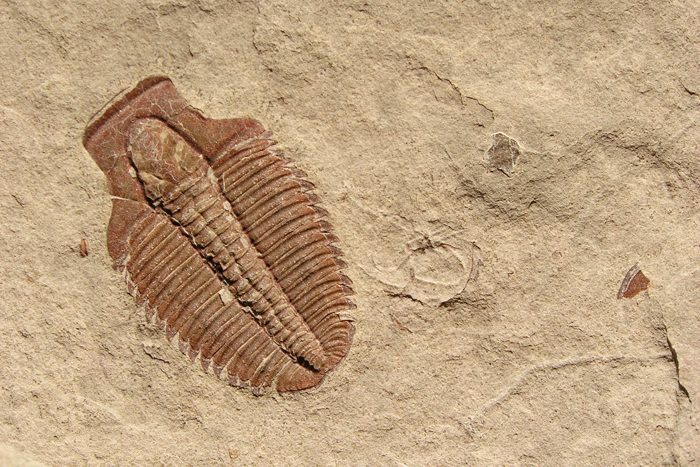 Fossil evidence suggests some trilobites were capable of swimming. The bodies of swimming trilobites are narrower and the eyes are closer to the sides of the cephalon, than those of bottom-dwelling trilobites. Swimming trilobites may have been predators, or they may have been “filter-feeders” using special appendages to remove nutrients from the surrounding water. 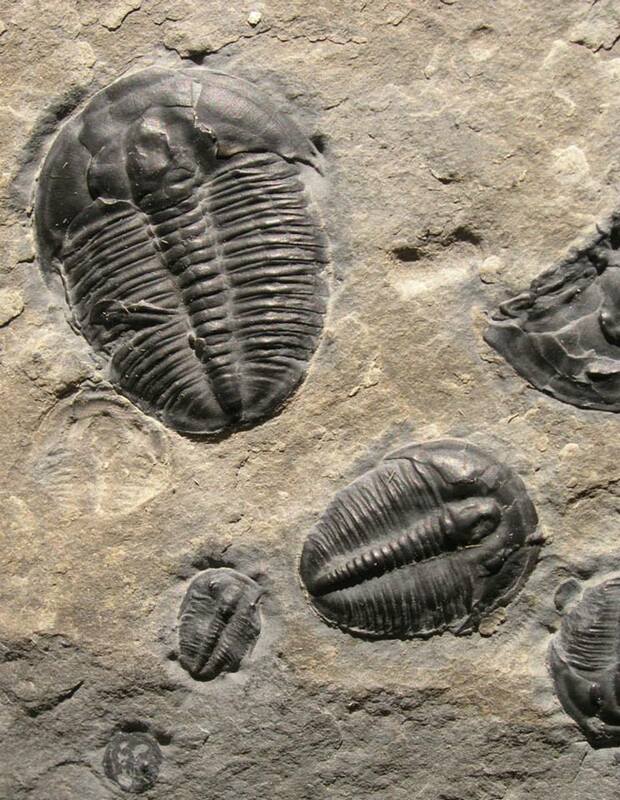 The smallest trilobites were plankton-like and lived close to the water surface. Where are trilobites found in Utah? Trilobites are probably the most common fossils collected in Utah, many world-class specimens from this state reside in museums throughout the world. In Utah, trilobites can be found at several localities. The Wheeler Amphitheater in the House Range, Millard County is one of the more well-known collecting areas. Most of the trilobites in this area come form the Middle Cambrian formation called the Wheeler Shale. The Wheeler Shale contains interbeds of shaley limestone, mudstone, and thin platy limestone. Another trilobite-bearing unit that directly overlies the Wheeler Shale in the central part of the House Range is the Marjum Formation. This formation consists of thin-bedded, fine-grained, silty limestone with interbeds of shale and mudstone. Also located in the central part of the House Range is a fossiliferous limestone called the Weeks Formation, that crops out in North Canyon near Notch Peak. The Weeks Formation overlies (is younger than) the Marjum Formation and also contains trilobites. Another trilobite-bearing unit is the Spence Shale Member of the Langston Formation in the Wellsville Mountains, Box Elder County. Here, trilobites can be found in Miner’s Hollow, Cataract Canyon, Dry Canyon, and the area between Antimony and Hanson Canyons. “A Collector’s Guide to Rock, Mineral and Fossil Localities in Utah” by James R. Wilson provides detailed descriptions on trilobite fossil localities. This book is available from the Natural Resources Map & Bookstore. Barnes, R. D., 1980, Invertebrate zoology: Philadelphia, Saunders College, p. 582-587. Gunther, L. F., Gunther, V. G., and Gunther, G., 1994, Some Middle Cambrian fossils of Utah, in Special issue on Utah: Utah Geological Survey Public Information Series 26, p. 59-62. Hintze, L. F. , 1988, Geologic history of Utah: Brigham Young University Geology Studies Special Publication 7, p. 14-19. Stokes, W. L., 1986, Geology of Utah: Utah Geological Survey Miscellaneous Publication S, p. 47-56. Wilson, J. R., 1995, A collector’s guide to rock, mineral and fossil localities in Utah: Utah Geological Survey Miscellaneous Publication 95-4, p. 65-104.